A native of Scotland, watercolor artist Eileen Ormiston, now lives in San Anselmo, California. Her paintings which blend flowers with still lifes and landscapes are in homes in the United States, Canada, England, Scotland, Sweden, Japan and New Zealand. Observing familiar objects such as favorite pieces of china, oranges, pears and apples will often spark the beginning of an idea for a painting. Painting flowers from her garden, reflections on water, shadows and changing light are a constant source of interest to her. Portal Publications of Novato, California have produced posters from her paintings, and Camden Graphics in London, England have produced cards from many of her paintings. She is represented by the Hanover Fine Arts Gallery in Edinburgh, Scotland. One of her paintings was juried into the 2017 edition of American Art Collector produced by Alcove Books of Berkeley, California. 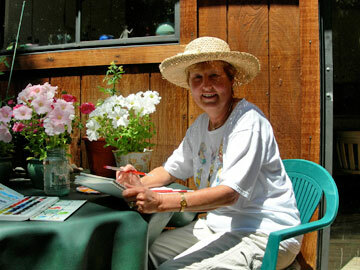 She is a member of the Marin Society of Artists of California. She enjoys participating in Marin Arts Council Open Studios, and the Marin Art Festival at Lagoon Park in San Rafael, California. The artist has studied watercolor with artists John Komisar, Ken Potter, Helen Stanley, Elaine Badgley-Arnoux, and Peter Kitchell. She has also taken watercolor classes at San Francisco State University and College of Marin.